London is hosting the Russian art week between 30th May and 6th June when the major auction houses will run a series of Russian art sales. Some most valuable lots are going to find new owners, and when millions of dollars are at stake, the question of authenticity is not a trivial one. Experts say it’s next to impossible to state 100 percent authenticity with a work of art, but physical diagnostic methods help minimise this uncertainty as well as investigate the origins of its creation. RBTH has talked to Dr Roman Maev, the founding Director-General of the Institute for Diagnostic Imaging Research in Windsor, Canada, and Honorary Consul of the Russian Federation in Canada, who has lead the development of special imaging technologies applicable to fine art analysis. Russia Beyond the Headlines: Your research is based in Canada and, as we are speaking now, the new commercialisation projects have brought you to London, but your scientific roots are in Russia. How did your life take this route? Dr Roman Maev: I had no ambition to leave Russia, but the 1990s was a tough time for Russian science, when most research budgets were cut down and many of my PhD students at the Moscow Institute of Physics and Technology chose better paid opportunities abroad. Under President Yeltsin contacts, which were established earlier through the Russian Governmental Programme in Technology Transfer, became much more difficult to maintain. So, when I received an invitation through an intergovernmental S&T commission to work in Canada, I took a couple of my PhD, whatever equipment I could, and we set up a research centre at the University of Windsor, Ontario, which eventually became the foundation for the Institute for Diagnostic Imaging and Research. Its expertise is primarily employed in the automotive and aircraft industries for analysing advanced materials’ structure and revealing construction flaws, but we soon started thinking of applying this know-how in other areas of research and development. RBTH: This looks like quite a leap to make from the automotive world to the art world! Dr Maev: In my youth I wanted to pursue both a career in physics and art. Although by my second year I had to drop my art studies at the Moscow State Stroganov Academy of Industrial and Applied Arts, I had developed a deep love for the art world. Almost 40 years later, I decided to try our original diagnostic methods on art pieces. The impressive results encouraged the development of more sophisticated imaging methods of non-invasive analysis. I then invited a few PhDs to join this project, which at the time looked like a risky endeavour. RBTH: Why would it be risky? It seems the research has been supported by the Canadian government. Dr Maev: The art community is very conservative, and it took a few years to hit the right chords: a mobile laboratory servicing galleries, homes, estates, auction houses, etc. could save the owner the insurance expenses for moving the piece of art to a laboratory. The portable equipment allows using just 3-5 sq m to work with a picture on-site. The business model of scientific know-how and commercialization has been provided by Tessonics, developing industrial diagnostic equipment’s, which, coupled with General Electric’s UK subsidiary, has allowed us to set up a dedicated art analysis company named The True Imaging Solution, offering imaging technologies to art experts globally. The academic research currently is based in Canada but the art market is mostly in Europe, and London. This is obviously why London is geographically most convenient to service it. RBTH: But surely a wealth of analysis techniques has been developed in the art world and has been employed by the top auction houses and galleries. Dr Maev: Yes. The fact is that only big museums can afford to have sophisticated in-house diagnostic facilities, the likes of New York’s Metropolitan Museum of Art or the Louvre in Paris. In Florence the laboratory at the Institute of Pietre Dure can service its own needs and maybe the Uffizi as well. But they would hardly service smaller museums or private galleries. Besides, the European ethical practices in art do not allow museums to accept paintings from private collectors for analysis and restoration. RBTH: Do you think establishing relationships with the auction houses will be a challenge for a company that is a newcomer to the market? Dr Maev: There is a lot of interest already. The auction houses pay hefty sums if fraud is revealed. It’s next to impossible to state 100 percent authenticity but the uncertainty can be reduced by analysing the comparable features of the painting through imaging techniques. My idea is to assist the auction houses in the run up to the auctions when they are compiling the exhibits, and go through the most expensive lots complimentary to traditionally used X-ray and art experts’ provenance records. RBTH: And what do imaging techniques add to the analysis which, say, X-ray can’t do? Dr Maev: An X-ray gives you just shadow images, while a combination of the whole range of infrared waves, terahertz and ultrasound waves, ultraviolet fluorescence, thermography imaging, etc. provides a layer by layer analysis of the painting from the first sketches on the canvas to the outermost surface, finally combining the results to create a 3-D image of the picture. The thermographic method allows for analysis at a chosen level: the canvas, the primer, and the layers of paint, which are uneven and depend on the stroke technique of the painter. Based on the temperature gradient effect, various areas cool down differently and we can see the variance as an image. These imaging methods thus show the way the picture was conceived and sometimes unveil the artist’s original ideas. 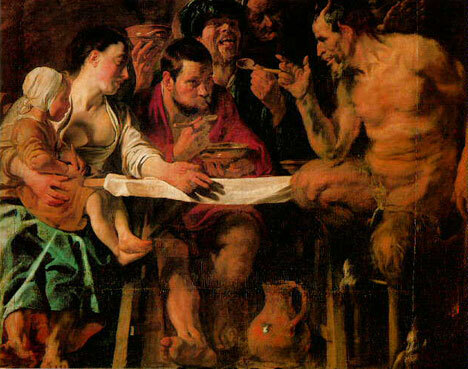 For example, in 2010 we worked with Moscow’s Pushkin Fine Art Museum on Satyr at the Peasant’s House by Jacob Jordaens and revealed many important details of the original painting which are absent from the final version. RBTH: But how do you know where and what to look for in a given case? Dr Maev: Usually an art-historian is looking for something in particular and commissions verification research. For example, in 2012 we worked in Norfolk with my colleague, Cambridge professor, Spike Bucklow, at an old Catholic church, St Mary’s, where some beautiful 16th century wooden panels disappeared during the Reformation. He wanted to confirm his guess that some of those panels were painted over and disguised as benches. After much effort combining various thermographic imaging techniques we got the result, and what a stunning sensation it was to see the faces of the saints shining at us through the 400 years wood panels! Roman Maev: But is it art? In July we will work with London’s National Gallery on a Rembrandt painting where X-ray identified the contours of a man at the bottom of the picture. Given the high price of the canvases centuries ago, painters often created their work on top of already used canvases. But sometimes these hidden elements are part of the painter’s original plan, and our task is to tell one from another. RBTH: And how is it possible to make this distinction in practice? A lot of times it is indeed detective work. For example, the subject of Rubens’s Roman Charity painting series dates back to Ancient Greek times portraying a young woman, Pero, secretly breast-feeding her father, Cimon, imprisoned and sentenced to death by starvation. The guards didn’t give her away and, and touched by this piety, released the man. In most pictures the woman’s breast is naked, but in one it’s half-covered. The thermographic imaging analysis showed that initially it was too uncovered, testifying to the fact that this painting belongs to the Rubens’s school of painting. The cloth was probably painted over to make the painting more spiritual. RBTH: But this in itself is hardly enough to verify the authenticity of a painting. Dr Maev: Not on its own, of course not. Modern data mining techniques now allow us to uncover a wealth of underlying characteristics unique to an artist and a computer algorithm we use helps classify this vast amount of data to match a painting to the author. We can analyse the canvas by X-ray and mathematical assessment of the size, density and weave pattern of the knots, as well as the deformation of the canvas tissue by the nails and the frame. When checked against the knowledge we have about a particular artist’s technique, preferred materials and locations, coupled with the pigment and brushwork analysis, the results can give us quite an accurate idea of the painting’s authenticity. Another identifier is a painting’s craquelure – the unique pattern of cracks formed on a painting with age – can also be used as a “fingerprint” for the artwork. Craquelure patterns can be traced back to the materials and methods employed by the artist, as well as the particular geographical area in which the painting was made or stored and matched against a prior record. The same forgery detection techniques are employed in a condition monitoring system to analyse the growth of cracks over time to aid in the preservation of the cultural heritage. RBTH: Presumably a lot of private collectors would like to discover the hidden stories “between the layers”! Dr Maev: Yes, European art collectors and enthusiasts have already shown interest in analysing the paintings inherited through family collections and private galleries. The same methods are used for similar deformation analysis of crockery and pottery, and metallic items, so there’s a lot of fascinating work head – and, let’s face it, it does take some “Sherlock Holmes” attitude! Dr Roman Gr Maev was born in Moscow, Russia. He received his Master of Science degree in Theoretical Nuclear Physics. In 1990 he received a Fellowship from Gore-Chernomirdin and as a result successfully defended a course project for the Scientific Business Management Fund for one semester of study at Harvard Business School (Boston, USA). From 1990 until 1995 Dr Maev, was deeply involved as one of the leaders in the Russian Governmental Program in Technology Transfer. During that period he and his team of experts successfully transferred a dozen high-tech technologies to market with an average value of $20-25 million dollars primarily in Europe. In 1995 Dr Maev was appointed a Full Faculty Professor in the Department of Physics at the University of Windsor in Canada where he moved in the frame of the Intergovernmental Russian-Canadian Exchange Research Program. In 2002 Dr Maev became the DaimlerChrysler/NSERC Industrial Research Chair, a title he still holds today. In 2004, based on an initiative by Chrysler, a new Canadian start-up high-tech company “Tessonics Corporation” was created. Its main mission is the commercialization of research products developed by Dr Maev’s R&D team at the University of Windsor. Today this company is well recognised in the U.S., Latin and Central America, Japan, UK, Germany, China, South Africa, etc. and is a registered supplier for Chrysler, Ford, BMW, Toyota, Magna, etc. Dr Maev has won many national and international awards for his innovations, research discoveries and inventions. He is a Fellow of IEEE, the Canadian Association of Physicists, the American Society for Nondestructive Testing, as well as the British Institute of NDT. Dr Maev is also the author of 5 monographs. Since 2001 he has been a member of the Canada-Russia Intergovernmental Economical Commission and both UK-Russia and Canada-Russia Business Councils. In 2008 Dr Maev was appointed Honorary Consul of the Russian Federation in Canada (Windsor, Ontario). Dr Roman Maev has been a member of the Rotary Club of Windsor (1918) since 1997.